Craft Cocktails: Blue Spirit’s Distilling This micro-distillery specializes in lime tequila and also bottles whiskey, rum, vodka and gin, for whatever your sipping desires might be. You can book an entertaining mixology lesson … or stop in and try the Dirty Pickle Martini, Raspberry Lemondrop or Ginger Lemon Burst. Craft Breweries: Icicle Brewing Company uses local ingredients in its beer production, including water from nearby Icicle Creek. Take a free brewery tour (every Saturday and Sunday) at the tasting room, or stop by and try award-winning beers like Bootjack IPA, Colchuck Raspberry Wheat or Dark Persuasion. 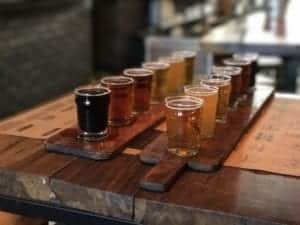 Craft Cider: Leavenworth Cider House invites you to discover hard cider with 28 thoughtfully selected ciders on tap from brewers like Alpenfire Cider, Finn River Farm, Tieton Cider Works, and many more. Along with those tasty beverages, enjoy local, seasonal and regional specialty foods that pair well with crafted ciders. This entry was posted in Dining by innkeeper. Bookmark the permalink.